Is Taco Bell set to open new branch in Doncaster's Frenchgate Centre? Is Taco Bell planning a second branch in Doncaster? Rumours are growing that fast food chain Taco Bell could be set to open a branch in Doncaster's Frenchgate shopping centre. The chain, which also has plans on the table to open an outlet on the Lakeside retail park next year, is rapidly expanding its empire across the UK and the Free Press understands from several sources that the firm could be considering opening a branch within the Frenchgate Centre. There have been suggestions that the firm could occupy the former Shake 'N' Burger outlet which was previously occupied by Ed's Diner. However, Frenchgate has said it has no comment to make on the speculation and Taco Bell have also declined to comment at this stage. Earlier this year, it was confirmed that Taco Bell would be opening a branch at Lakeside as part of the new so-called Herten Triangle complex which is set to open in 2019. The £8 million project will also see the opening of a Burger King, Costa, Creams, Dunkin' Donuts, Estabulo and TGI Fridays on land near to the Asda supermarket and Dome leisure centre. 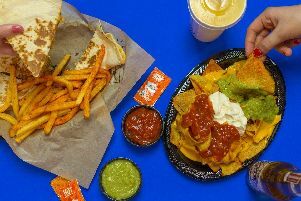 Taco Bell, which already has branches in Rotherham, Barnsley and Sheffield, was founded in the USA in 1962 and has more than 7,000 restaurants across the globe. Shake 'N Burger closed down earlier this year, less than a year after opening. It's predecessor, Ed's Easy Diner opened in December 2015 but closed in October the following year after the chain went into administration.